Group discussions focus on the events of the death, related feelings, coping skills, validation and support for group members. Non and denominational support group. Meets from 7:00 - 8:30 PM on the 1st and 3rd Thursday of every month. Meetings held at St. Jude the Apostle (1025 W 5th Ave) contact Linda Hillary at (920) 235-6002. Support group for adults who have lost an adult loved one and are actively grieving. Meetings are held in the Fox Cities 3 times a year for 6 consecutive weeks. Sessions are held February - March, April - May, and September - October. Pre registration is preferred. 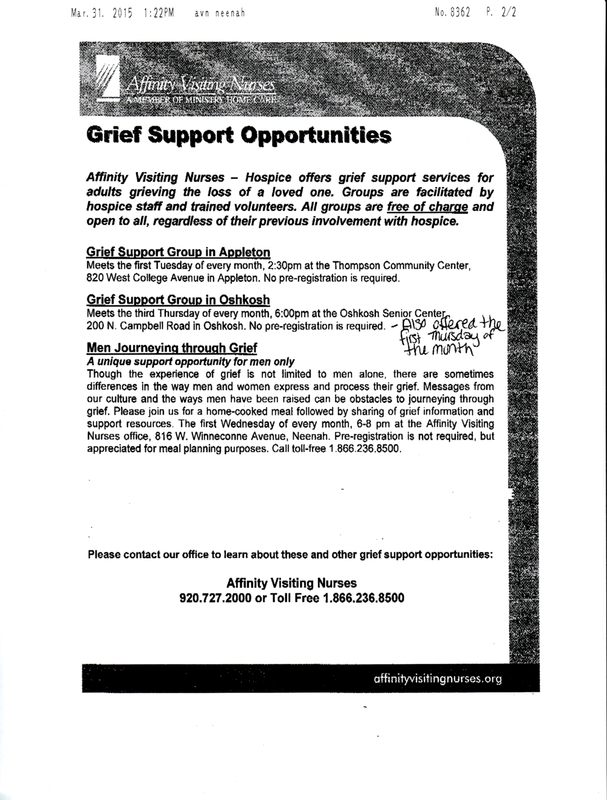 Affinity Visiting Nurses - Hospice offers grief support services for adults grieving the loss of a loved one. Groups are facilitated by hospice staff and trained volunteers. All groups are free of charge and open to all, regardless of their previous involvement with hospice. Meets the first Tuesday and third Thursday of every month at 6:00 pm at the Oshkosh Senior Center, 200 N. Campbell Road in Oshkosh. No pre-registration is required. Metts the first Tuesday of every month, 2:30 pm at the Thompson Community Center, 820 West College Avenue in Appleton, no pre-registration is required. This is a parent led support group for those who have experienced the loss of a child through miscarriage, ectopic, molar pregnancy, stillbirth or newborn death. Their website also contains information about resources you may find helpful, and news about upcoming events. This is a forum where you can discuss your feelings with others who have experienced a loss. This is a known nation-wide group offering support for families experiencing death of a child at any age. The local chapter offers monthly support group meetings. Share is a nationally known organization offering support for families who have lost their child to miscarriage, ectopic, molar pregnancy, stillbirth or newborn death. First Thursday of each month at 7:00 p.m.
Miss Foundation is a support website for grieving parents. The foundation is centered on "C.A.R.E." counseling, advocacy, research, and education services to families experiencing the death of a child. Support group for parents of miscarriage loss, stillbirth, newborn, or infant deaths. Support group for people whose children or other family member or friend has been murdered. Support group and information for those who have lost a child, family member, or a friend through drunk driving. 365 days a year short term counseling and grief counseling over the telephone. Also resource and referral service for all kinds of help. Information on agencies and services in Oshkosh and surrounding area. A unique support opportunity for men only. Though the experience of grief is not limited to men alone, there are sometimes differences in the way men and women express and process their grief. 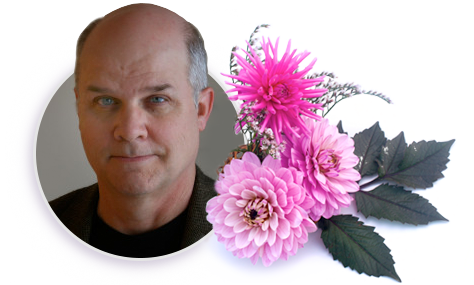 Messages from our culture and the ways men have been raised can be obstacles to journeying through grief. Please join us for a home-cooked meal followed by sharing of grief information and support resources. The first Wednesday of every month, 6-8 pm at the Affinity Visiting Nurses Office. Pre-registration is not required.